I'm back to Peppa Pig again and this time it’s a big 3D Peppa Pig Strawberry Chiffon Cake! =) The 3D Peppa Pig Chiffon Cake is made entirely of strawberry chiffon cake and I made it such that she looks like she’s happily sitting (on a 12-inch cake board). The base chiffon cake is baked in a doll cake mold (I had previously shared in my Elsa doll post I was excited as it has a centre tube) with added red yeast powder to darken the shade. I have found that too much red yeast powder deflates the meringue and it is essential or helpful to add ½ tsp baking powder to the recipe. The face is carved and cut out from chiffon cake similar to my previous Peppa Pig chiffon cake. I used cake dowels to support the head. The center hole in the doll chiffon cake came in very useful here =). Thank God she loved it and said it was yummy (baker’s great joy!). 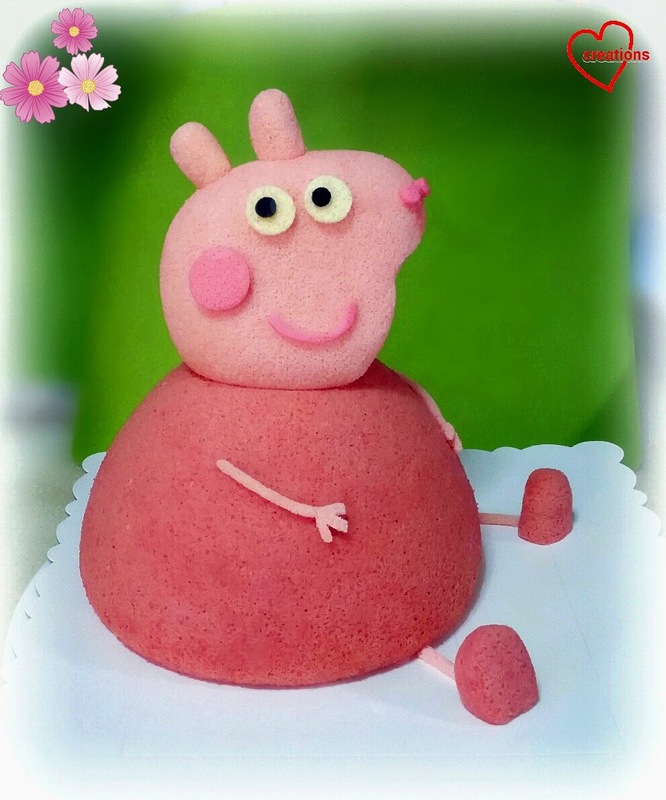 Do you make to sell this 3D peppa pig chiffon cake? It's more of a hobby but we do take orders if we can cope with them (and family). Just drop me an email. Thanks!